The Pacific-10 Conference honored the Arizona State men's tennis team with three All-Conference awards and four All-Academic accolades. Head Coach Lou Belken was named Pac-10 Coach of the Year after guiding the Sun Devils to their first NCAA Tournament berth since 2004. 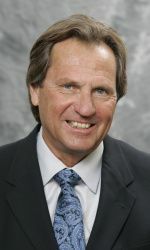 Belken had previously been named Pac-10 Coach of the Year in 1999. Matt Brooklyn received First-Team honors. The sophomore was nationally ranked in both single and doubles throughout the season. Brooklyn primarily competed in the No. 1 slot for the Sun Devils and finished the season ranked 67th in singles by the ITA. He and doubles partner T.J. Bellama also finished second at the Pac-10 Championship and ended the season ranked 40th nationally. Newcomer Andres Arango stormed into the Sun Devils lineup and earned Second-Team honors from the Pac-10. The sophomore finished his season ranked 76th by the ITA, after picking up several victories over ranked opponents. In addition to the All-Conference awards, four Sun Devils were named to Pac-10 All-Academic Teams for their outstanding work in the classroom. Junior Bellama and sophomore Jack Marsh were both named to the Pac-10 All-Academic First-Team. Bellama compiled a 3.76 in kinesiology while Marsh, also a kinesiology major, earned a 3.74. Brooklyn earned second-team recognition with a 3.37 grade point average in interdisciplinary studies while Wes Miller was named to the honorable mention team.